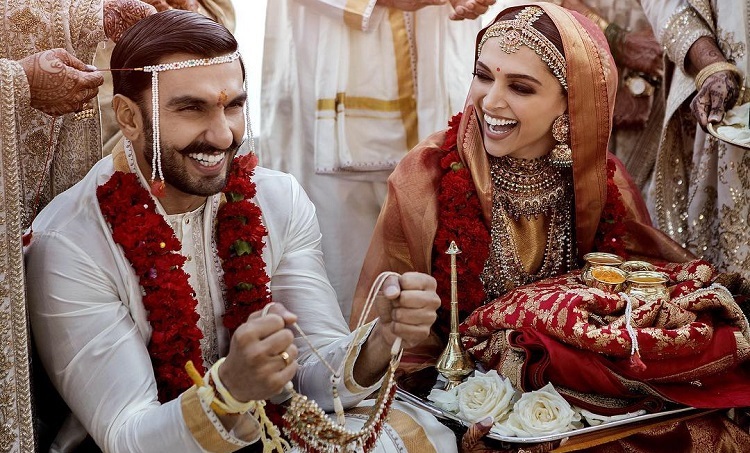 Ranveer Singh and Deepika Padukone got married to each other last year in Italy and since then the duo has been setting out couple goals. Whether it's dinner dates, or airport diaries and award functions, the two seem to never get enough of each other. Recently at the Zee Cine Awards 2019, both Ranveer Singh and Deepika Padukone arrived to glam up the award ceremony. However, these two were spotted performing their marriage rituals once again and this time in front of the whole celebrity audience including Deepika Padukone's ex-boyfriend Ranbir Kapoor. The hosts of the award night Kartik Aaryan and Vicky Kaushal made this happen for Deepika and Ranveer's fans. So what if no one got the chance to see the two perform wedding rituals on their big day, Vicky and Kartik made this happen live in front of everybody. While Kartik becomes to 'agni' or sacred fire for the two to take 'pheres', Vicky seemed to perform their wedding once again. Meanwhile, on the work front, Ranveer will be next seen in the Kapil Dev biopic 83 and Deepika will be seen portraying the acid attack survivor Laxmi in Meghna Gulzar's Chhapaak.